The New Holland Construction new Super Boom skid steer loaders drew a lot of attention at the National Farm Machinery Show today. These 200 Series machines have been years in the making. I spoke with Dave December, Marketing Manager, New Holland Construction and Jorge De Hoyos, Global Product Marketing Manager to learn all about these new products. They sell skid steer loaders throughout their dealer network that includes ag equipment dealers. With the new 200 Series, New Holland maintains the best-in-class forward dump height and reach with the Super Boom® loader vertical lift design – and introduces breakthrough productivity improvements. The new skid steers culminate five years of customer research, design and engineering improvements. In our interview you can hear all about the New Holland Construction Super Boom Road Show which is an open house customer event held at New Holland dealerships across North America. 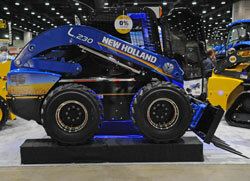 The event includes a skid steer challenge featuring New Holland’s new 200 Series skid steer loaders. 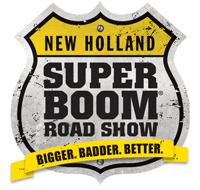 The Super Boom Road Show will take place at 35 New Holland dealerships across the United States and Canada. Highlighting each event is a skid steer challenge where equipment operators compete for the best time on a special course. Prizes and cash are awarded to the top finishers. In addition, the operator who wins each local competition will be flown to Louisville, Ky., to compete in a final competition during GIE+EXPO 2011 (Oct. 27-29) to determine the North American champion. The grand prize winner will receive a new, fully-loaded New Holland 200 Series skid steer loader – valued at $35,000 – for their sponsoring company, plus $5,000 and New Holland gear for the operator.